The tragedy that occurred in Charleston, South Carolina, Wednesday, June 17…it’s been so hard for me to articulate my feelings about it. All senseless acts of violence hurt to the core and yet this particular act of a hate crime has stung me in my heart. Nine lives were killed inside of the historically Black church Emanuel African Methodist Episcopal during what was meant to be another uplifting weekly Bible study. As I imagined those women and men, all Black, gathering to pray as they always have, thankful for a haven that is safe from the world outside that feels too cold to be real, their earnest talk was disrupted and broken by the evil being of 21-year-old, White male Dylann Roof. With his malicious plan in tow, allegedly planned as far as six months ago, to harm and murder innocent Black South Carolinians, an hour after pretending he was one with them in study, he viciously silenced them forever with the triggers of his gun. When I originally wrote those two paragraphs above, I had to pause several times. To think. To reflect. To gently wipe away tears I weakly attempted to hold back. In times like these, it feels foolish to ask God “why” for it’s like years before some kind of esoteric answer is delivered. But I did and I wanted to know why must the malignant ones, just like Roof, always had to get their way? Sanders was the youngest. He was 26 years old and was there in attendance with his aunt Susie Jackson. He had tried to save Jackson from one of Roof’s bullets when he jumped in front of her body during the attack. When I read the names, saw the pictures of the victims and came across a New York Times eulogy written by scholar Henry Louis Gates, Jr. for AME’s Pastor Pinckney (a respected and well-liked gentlemen and State Senator), I again froze. Deep into my questions of why and a paralyzed sense of action that I was again given, indirectly, by an individual that led a hateful, angry and racist life and had imposed their immoral lifestyle upon us all. Off and on since Thursday morning, I’ve remained disheartened that a place where so many go to refuel their hope and trust in faith and goodwill, for now, is the scene of terrorism. I’m emotional over the pain the surviving loved ones are experiencing and its citizens that feel their town has become the newest example of an American downfall. As today, June 19, also marks the 150th anniversary of Juneteenth, the official day in 1865 when slavery was abolished in the United States it’s been a somber two and a half days for Black America. Collectively, I know much of us feel tired. Drained. Who out there was not listening when millions marched and even got arrested for “Black Lives Matter”? I haven’t even seen the hashtag in connection to the Charleston shooting as now the frequent acknowledgment Black lives bereaved has made us go from angry to dejected. And those passionate articles online about “America’s race problems” and “history of violence”? I wish racist killers like Roof would be the ones to read them and be educated and reborn most of all. Charleston. Charleston, South Carolina. As a part of the South, an American region that continues to be pigeon-holed as backwards in societal progression; I’ve become intolerable of such stereotypes because for the visits I’ve made into the South, particularly in Virginia, I’ve experienced nothing but kindness and gratitude from the Southerners I’ve met. Roof’s repugnant, White supremacist presence is a terrible contradiction to my memories. But when I’m in a Southern state as an East Coast city girl, my belief in Black pride arises, I’m treated as a lady by both Black and White men and I’m reminded of the factors that really matter in the only life we get to live: love, happiness and humility. I felt it necessary to include those recaptures for that too made me sad about this incident. 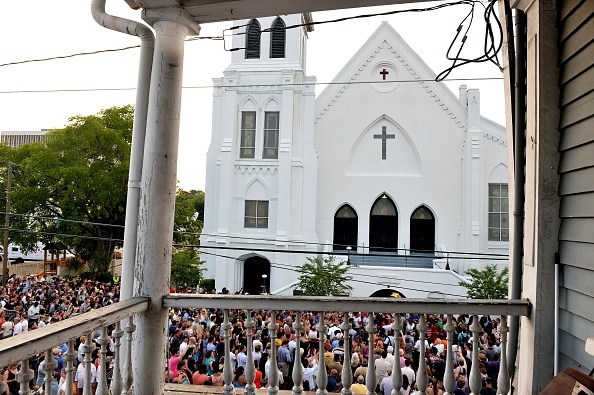 I know that everyone inside of Emanuel AME that night welcomed Roof with opens arms. Just a week ago, when I was in Harlem in New York City, I had walked to the steps of a church between 123rd and 124th street, struggling with a bag full of too many things. As I dropped my items dramatically on the steps, an elderly Black man took his time getting to the entrance and greeted me kindly. I said hello back and his kindness alone calmed me down. I can’t recall verbatim how he said it, but he suggested that I come by the church just seconds away from me church and that it would always be here when I was ready. I told him something like “I will” and while I still don’t know when, it felt nice that despite any issues that I might’ve been going through, as a youth in his days, I too deserved to know that I was loved and be reminded that God is here. Newtown. Oklahoma City. Chapel Hill. Now we must add Charleston, for 2015, on the list. The list of innocent lives gone because of racism, violence and the nefarious. But just like my Bostonians who proclaimed with dignity and conviction that they would run again after the vicious bombing at the finale of the Boston Marathon in 2013, we will pray again and in the same spot you tried to eradicate us in. This letter is for Charleston in South Carolina. Previous Previous post: Jessica Alba Is Preparing To Introduce The Honest Company’s Makeup Line!